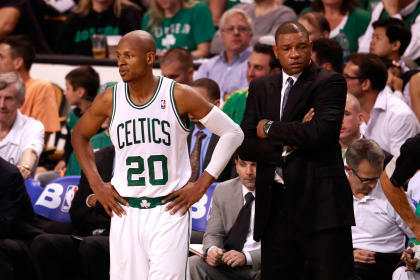 Ray Allen is leaving the Boston Celtics to sign with the Miami Heat, Heat owner Micky Arison said on his Twitter account. "Its 2:30 a.m. in London and I was just woken up with great news. Welcome to the family #20!!" Arison tweted, a reference to Allen's No. 20 jersey. Multiple league sources confirmed to Yahoo! Sports that Allen has committed to joining the Heat. Allen met with Heat officials Thursday in Miami and was debating between joining the NBA's defending champions or re-signing with the Celtics. Allen played five seasons with the Celtics and helped them win the 2008 NBA championship. An unrestricted free agent, Allen turned down more money from the Celtics to play for the Heat. Miami is limited to giving Allen the taxpayers' midlevel exception, worth $3.1 million annually, over three years. The Celtics were reportedly offering Allen about $6 million a season in a two-year deal. "We're not stealing him," LeBron James told Y! Sports shortly before Allen's decision. "He's unrestricted. He isn't with nobody, man. Ray is a huge piece out there. "Who wouldn't want a dead-eye shooter like that, a complete professional and a champion? He has all the qualities for a team to get over the hump or to compete for a championship each and every year." The Celtics reached agreement with Dallas Mavericks free-agent guard Jason Terry earlier this week, but team officials had also hoped to bring back Allen.